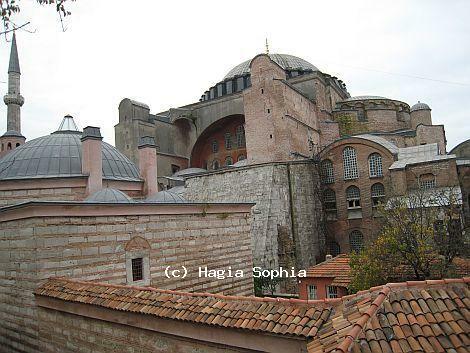 Justinian’s Hagia Sophia is the one that stands today. It is an architectural intelligence and the first masterpiece in Byzantine architecture. It has been the largest cathedral for 1000 years until the Seville Cathedral was built. The church has a rectangular shape, and the square vast square nave measuring 31m (102ft) is covered with a central dome that is carried on four pendentives. The arcade around the dome is unbroken with 40 arched windows to bring the light inside. Excluding the two narthexes and the large atrium, the basilica measures 70 x 75 m (229 x 245 ft) . The atrium measures 48 x 32 m (157 x 106 ft) and the total length of the construction measures 135 m (442 ft). The narthex outside at the eastern part of atrium is enclosed, and the inner narthex is entered by 5 doors, and from this inner narthex there are 9 doors to the nave. The accesses to upper galleries are provided by ramps, which are traditional feature of Constantinopolitan church planning.